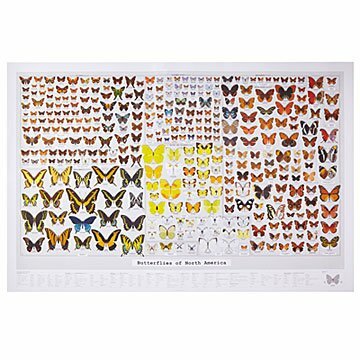 Over 500 species of North American butterflies flutter taxonomically on this hand-illustrated chart. Over 500 species of butterflies take wing in this massive graphic lepidopterarium ("butterfly house" in science-speak). The gorgeous product of hundreds of hours of intricate illustration work, the chart orders the fluttering creatures taxonomically, with a colorful rendering of each species' distinctive dorsal wing. (Some species include a cross-section of its ventral underside.) As educational as it is breathtaking, the colorful poster showcases the amazing diversity of North America's butterflies from Papilionidae (swallowtails) to Lycaenidae (gossamer-winged) and Monarchs to Dainty Sulphers. Designed and made by Ben Gibson and Patrick Mulligan in Brooklyn, New York.